CHARLESTON, WV – Gov. 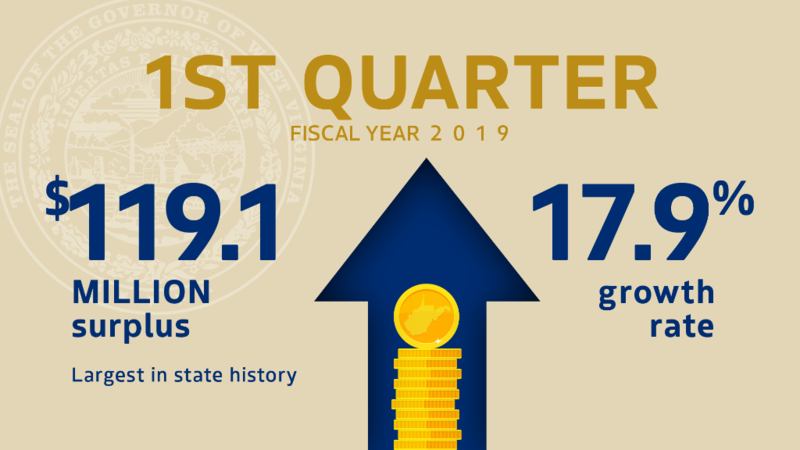 Jim Justice announced today that the state’s General Revenue Fund collections continue to far exceed estimates and that the first quarter surplus for Fiscal Year 2019, $119.9 million, is the highest first-quarter surplus in West Virginia’s history. Year-to-date collections show West Virginia at an annualized growth rate of nearly 18%. 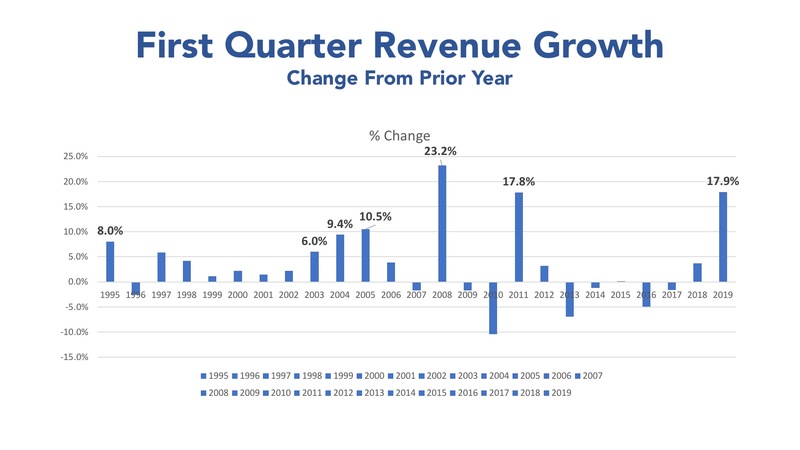 "An annualized growth rate of 18% is frankly unheard of." Gov. Justice said. September General Revenue Fund collections of $452.9 million were nearly $54.1 million above estimate and 16.4% above prior year receipts. 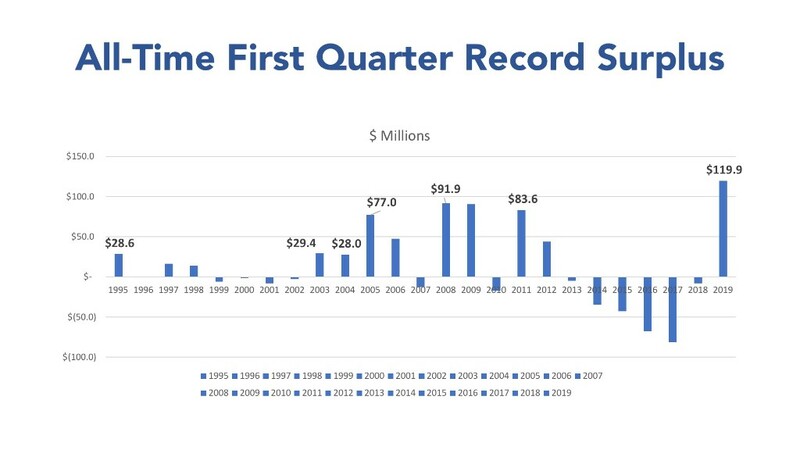 The increase from prior year receipts was attributable to a $40.1 million increase in monthly Personal Income Tax collections, an $11.2 million monthly increase in Consumer Sales tax collections and a $9.2 million increase in monthly Corporation Net Income Tax collections. These three revenue sources accounted for 95% of the increase in collections from the prior year and for 85% of the monthly surplus over estimates. Year-to-date General Fund Severance Tax collections were 71.3% ($40.2 million) ahead of last year. Year-to-date General Fund Consumer Sales Tax collections were 16.6% ($46.6 million) ahead of last year. Year-to-date Personal Income Tax collections were 16.0% ($69.4 million) ahead of last year. Year-to-date Corporation Net Income Tax collections were 27.9% ($10.3 million) ahead of last year. September Personal Income Tax collections of $217.6 million were $29.5 million above estimate and 22.6% above of prior year receipts.The gain in net revenue from the prior year was due to higher than expected withholding tax receipts. Income withholding tax payments of $149.8 million were 25.7% above prior year receipts and reflect a combination of improving wage and employment growth. Cumulative withholding tax collections of $418.5 million were 15.9% above prior year receipts. Withholding tax collections previously grew by 9.1% during the final three months of FY2018. Data from the WorkForce WV August employment report showed private-sector employment growth of 1.0% over the prior year with 40% of the job growth concentrated in the construction sector. September Consumer Sales and Use Tax collections of nearly $121.2 million were $5.2 million above estimate and 10.2% above prior year receipts. Cumulative collections were $21.2 million above estimate and 16.6% ahead of prior year receipts. Overall collection growth, including transfers to special revenue funds, was a robust 11.8% for the year-to-date. After rising at a more modest clip of roughly 2% during most of last year, total sales tax collections rose at much higher rates of 7.8% in June, 13.3% in July, 12.9% in August and 10.1% in September, respectively. 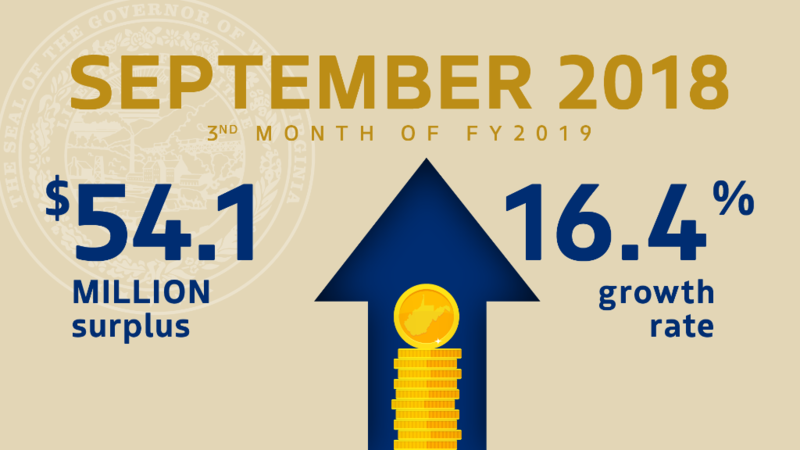 September General Revenue Fund Severance Tax collections of nearly $33.8 million were $4.7 million above estimate and 8.3% ahead of prior year receipts. Year-to-date collections were nearly $35 million above estimate and 71.3% ahead of prior year collections. Total cumulative severance tax collections for all funds were up by nearly 48%. Recent strong growth in collections was partially attributable to growth in the value of foreign exports of coal. In addition, natural gas prices are trending a bit higher than last year with greater summer price stability this year. September Corporation Net Income Tax collections of more than $41.1 million were nearly $11.3 million above estimate and 28.8% higher than prior year receipts. Cumulative collections of more than $47.0 million were $10.4 million above estimate and 27.9% ahead of prior year receipts. Tobacco Products collections totaled nearly $13.8 million in September, an amount that was $0.2 million below estimate and 3.2% below prior year receipts. Cumulative collections were still nearly $1.1 million above estimate and 1.6% below prior year receipts. September Business and Occupation Tax collections of nearly $6.3 million were roughly $0.1 million below estimate. Cumulative collections of $25.8 million were $1.4 million above estimate and 2.9% ahead of prior year receipts. Insurance Premium Tax collections of $0.7 million were $0.4 million above estimate in September. Year-to-date collections of $29.9 million were $1.3 million above estimate and 6.8% ahead of last yeardue to higher insurance premiums in a growing economy. In September, total State Road Fund collections of $119.2 were $0.7 million below estimate, but 30.9% above prior year receipts. The shortfall was largely due to an $8.8 million shortfall in federal reimbursements. All other collections were collectively $8.1 million above the monthly estimate and 27.5% ahead of prior year receipts due to a 59.3% rise in Motor Fuel Excise Tax collections. Motor Fuel Excise Tax collections exceeded estimates by $7.3 million in September after falling short of estimate by $12.2 million in August. A significant portion of the Motor Fuel Excise Tax due on August 31st was not remitted by affected Taxpayers until early September. Monthly License and Registration Fee collections were nearly $1.5 million above estimate and 11.4% ahead of prior year receipts. Monthly Motor Vehicle Sales Tax collections of $19.1 million were $0.2 million above estimate and 3.4% ahead of prior year receipts. Cumulative State Road Fund collections of $371.2 million were $1.7 million below estimate and 14.0% ahead of prior year receipts. Discounting federal reimbursements, total collections of nearly $234.1 million were $30.8 million above estimate and 13.3% ahead of prior year receipts. Cumulative Motor Fuel Excise Tax collections were $15.4 million above estimate and 23.0% ahead of last year. Cumulative License and Registration Fees were $9.9 million ahead of estimate and 24.2% ahead of last year. Cumulative Motor Vehicle Sales Tax collections were nearly $6.8 million above estimate and 14.8% ahead of prior year receipts.